This event goes hand-in-hand with the Reykjavik Cultural Night and although international attendance at the marathon is still small, the overall cultural experience is increasing in popularity every year. 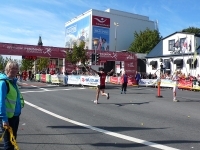 The marathon has a fantastic festive atmosphere with many spectators encouraging the athletes from the sidelines. It takes place in and around the beautiful city of Reykjavik and the runners get to enjoy the scenic location of the race. Apart from the marathon there is a half-marathon, a six-mile (10km) run, and a two-mile (3km) fun run.